1. 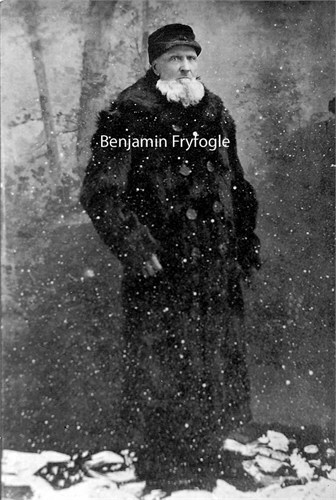 REV BENJAMIN FRYFOGLE was born on October 16, 1830 in Columbiana County, Ohio, USA. He died on April 25, 1917 in Sunfield Township, Eaton County, Michigan, USA. He married Christiana Munk, daughter of Jacob Munk, on October 23, 1851 in Columbiana County, Ohio, USA. She was born on June 17, 1831 in Himaulda, Germany. She died on January 28, 1916 in Sunfield Township, Eaton County, Michigan, USA. 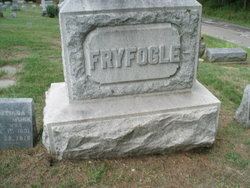 i. ADDISON FRYFOGLE was born on August 22, 1852 in Columiana County, Ohio. He died on March 28, 1918 in Garden City, Cherokee County, Kansas, USA. He married Barbara A. ? in 1873. She was born in November 1854 in Indiana, USA. ii. IONA IRILLA FRYFOGLE was born on August 18, 1857 in Columbiana County, Ohio, USA. She died on November 16, 1935 in Mecosta County, Michigan, USA. She married Ira Benjamin Trowbridge Sr., son of Jeremiah 'Jerome' Trowbridge and Elizabeth Rice, on December 24, 1875 in Eaton County, Michigan, USA. He was born on March 18, 1854 in Noble County, Indiana, USA. He died on November 07, 1929 in Sunfield, Eaton County, Michigan, USA. iv. 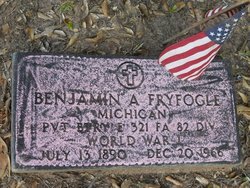 BENJAMIN F. FRYFOGLE was born on May 30, 1862 in Orange, Noble County, Indiana, USA. He died in 1946 in Lucedale, George County, Mississippi, USA. He married (1) ISABELLA F. TROWBRIDGE, daughter of Jeremiah 'Jerome' Trowbridge and Elizabeth Rice, on August 02, 1880 in Sunfield Township, Eaton County, Michigan, USA. She was born on September 17, 1859 in Wayne, Noble County, Indiana. She died on March 31, 1899. He married (2) LULA ALMA DUNBAR, daughter of Theodore M. Dunbar and Mary E. West, on February 26, 1903 in Sunfield, Eaton County, Michigan, USA. She was born on August 02, 1866 in Dennison, Iowa, USA. She died in 1933 in Lucedale, George County, Mississippi, USA. ADDISON FRYFOGLE was born on August 22, 1852 in Columiana County, Ohio. He died on March 28, 1918 in Garden City, Cherokee County, Kansas, USA. He married Barbara A. ? in 1873. She was born in November 1854 in Indiana, USA. i. RILLA FRYFOGLE was born about Abt. 1873 in Indiana, USA. ii. ELIZABETH C. FRYFOGLE was born on April 06, 1877 in Sunfield, Eaton County, Michigan, USA. She died on August 07, 1877 in Sunfield, Eaton County, Michigan, USA. IONA IRILLA FRYFOGLE was born on August 18, 1857 in Columbiana County, Ohio, USA. She died on November 16, 1935 in Mecosta County, Michigan, USA. She married Ira Benjamin Trowbridge Sr., son of Jeremiah 'Jerome' Trowbridge and Elizabeth Rice, on December 24, 1875 in Eaton County, Michigan, USA. He was born on March 18, 1854 in Noble County, Indiana, USA. He died on November 07, 1929 in Sunfield, Eaton County, Michigan, USA. Death 7 November 1929 - Ira Trowbridge was born March 18, 1854, near Kendallville, Noble county, Indiana, near what then called Sachrider Lake, at which place he spent many happy days. His father enlisted in war in 1861, when Ira was four years old. When he was about eight years old his father returned home only to enlist again for another three years, leaving his family to endure many hardships until his return. At the age of about 11 Ira with his parents and one older brother, William, who proceeded him in death and one sister, Mrs. Belle Fryfogle, (also deceased some years ago) came to Sunfield township with a two horse team the stock such as cows to the wagons. They were five days making the trip overland. They located on the farm now known as the Philip Green farm south of Sunfield but were there only a short time and then located on what is now the Fred Wilcox farm which was all timber at that time and Ira and his father cleared the most of it. At this place was born a brother, Samuel, and a sister, Mrs. William Frantz. During these days Ira would drive an ox team to Portland with a grist of corn for the family needs, which would take a day's time to make the trip for in those days we had no such roads as now. 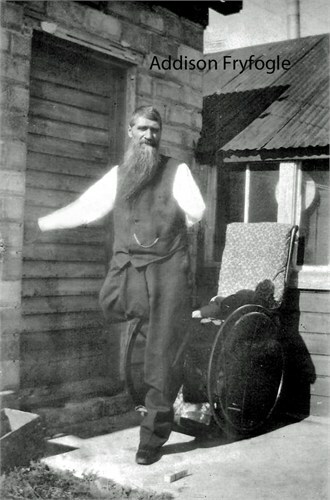 December 23, 1875 he was united in marriage to Iona Fryfogle and moved onto the farm where he resided until his death. To this union were born five children: Justin M. Trowbridge of Flint, Austin G. Trowbridge of Lansing, Mrs. Sana Wetherbee of Sunfield, Bennie I. Trowbridge, and Mrs. Lucy Brovont; also leaves nine grandchildren, two great grandchildren, a host of relatives and friends, of which all mourn the loss of a very affectionate and loving father and grandfather. Funeral was held at the home at two o'clock November 9, 1929, with a host of relatives and friends present. Those from a distance were from Kendallville, Indiana, Toledo, Detroit, Lansing, Flint, Butternut, Lake Odessa, and Covington, Kentucky. 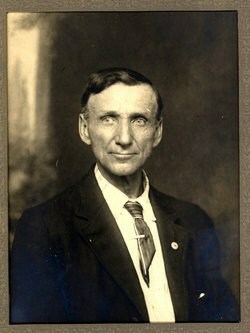 i. JUSTIN MARTIN TROWBRIDGE was born on October 12, 1876 in Sunfield Township, Eaton County, Michigan, USA. He died on September 09, 1955 in Gladwin, Gladwin County, Michigan, USA. He married Amanda Belle Brovont, daughter of Daniel Brovont and Amanda 'Emma' Bottorff, on March 16, 1899 in Sunfield, Eaton County, Michigan, USA. She was born on June 10, 1880 in Medina, Ohio. She died on February 11, 1963 in Gladwin, Gladwin County, Michigan, USA. Mrs. Amanda Trowbridge, a former resident of this locality, passed away February 11, 1963 at Gladwin, Michigan. she was 83 years of age. Surviving are two daughters and three grandchildren; three brothers, William Brovont of Sunfield, John and Elmer of Rossville, Indiana; and two sisters of St. Petersburg, Florida. Burial was at Gladwin. ii. AUSTIN GUY TROWBRIDGE was born on December 07, 1878 in Sunfield Township, Eaton County, Michigan, USA. He died on July 20, 1954 in Sunfield, Eaton County, Michigan, USA. He married Mary Magdalene 'Lena' Hager, daughter of William R. Hager and Abigail P. Perkins, on October 02, 1904 in Sunfield, Eaton County, Michigan, USA. She was born on February 27, 1872 in Sunfield Township, Eaton County, Michigan, USA. She died on December 05, 1947.
iii. CELESTE CHRISTIANA 'SANA' TROWBRIDGE was born on September 12, 1880 in Sunfield Township, Eaton County, Michigan, USA. She died on August 17, 1956 in Sunfield Township, Eaton County, Michigan, USA. She married (1) ? JOHNSON after Aft. 1931. She married (2) JAMES W. WETHERBEE, son of Seth L. Wetherbee and Abbey ?, about Abt. 1908. He was born in 1878 in Michigan, USA. He died on October 08, 1931 in Sunfield, Eaton County, Michigan, USA. iv. IRA BENJAMIN TROWBRIDGE JR was born on May 03, 1883 in Sunfield Township, Eaton County, Michigan, USA. He died on January 18, 1956 in Sunfield Township, Eaton, Michigan, USA. He married Minnie Belle Gray, daughter of Mark Gray and Sabrina Davis, on October 01, 1904 in Sunfield, Eaton County, Michigan, USA. She was born on February 03, 1885 in Sunfield Township, Eaton County, Michigan, USA. She died on February 04, 1964 in Lansing, Ingham County, Michigan, USA (Lansing Hospital, Lansing, Ingham County, Michigan). v. LUCY L. TROWBRIDGE was born on February 10, 1890 in Delta, Eaton County, Michigan, USA. She died on August 13, 1984 in Immanual Nursing Home, Charlotte, Eaton County, Michigan. She married (1) ? OBERLIN. She married (2) WILLIAM GLEN BROVONT, son of Daniel Brovont and Amanda 'Emma' Bottorff, on November 28, 1907 in Sunfield, Eaton County, Michigan, USA. He was born on October 06, 1888. He died on February 10, 1971 in Sunfield Township, Eaton County, Michigan, USA. She married (3) AARON E. BROVONT. He was born on February 17, 1889 in Ohio, USA. He died on March 01, 1938 in Lansing, Ingham County, Michigan, USA. BENJAMIN F. FRYFOGLE was born on May 30, 1862 in Orange, Noble County, Indiana, USA. He died in 1946 in Lucedale, George County, Mississippi, USA. He married (1) ISABELLA F. TROWBRIDGE, daughter of Jeremiah 'Jerome' Trowbridge and Elizabeth Rice, on August 02, 1880 in Sunfield Township, Eaton County, Michigan, USA. She was born on September 17, 1859 in Wayne, Noble County, Indiana. She died on March 31, 1899. He married (2) LULA ALMA DUNBAR, daughter of Theodore M. Dunbar and Mary E. West, on February 26, 1903 in Sunfield, Eaton County, Michigan, USA. She was born on August 02, 1866 in Dennison, Iowa, USA. She died in 1933 in Lucedale, George County, Mississippi, USA. i. CECILEY BELLE FRYFOGLE was born on March 14, 1881 in Sunfield, Eaton County, Michigan, USA. She died on January 22, 1926 in Toledo, Lucas County, Ohio, USA. She married Charles O. Downs, son of Eugene Downs, on May 08, 1898 in Sunfield Township, Eaton County, Michigan, USA. He was born on January 22, 1875 in Castleton Township, Barry County, Michigan, USA. He died on March 05, 1931 in Toledo, Lucas County, Ohio, USA. ii. BERTHA MAY FRYFOGLE was born on July 03, 1887 in Sunfield Township, Eaton County, Michigan, USA. She died on October 21, 1887 in Sunfield Township, Eaton County, Michigan, USA. iii. LULA BELL FRYFOGLE was born on February 18, 1889 in Sunfield Township, Eaton County, Michigan, USA. She died on May 19, 1962 in Toledo, Lucas County, Ohio, USA. She married (1) FRANKLIN V. FENDER, son of Allias D. Fender and Sarah Rhoop, on March 03, 1904 in Sunfield, Eaton County, Michigan, USA. He was born on June 18, 1880 in Woodland, Barry County, Michigan, USA. He died on July 26, 1974 in Toledo, Lucas County, Ohio, USA. She married (2) OSCAR MATHYS, son of Victor Mathys and Elsie Heer, on August 15, 1925 in Grand Ledge, Eaton County, Michigan, USA. He was born on June 14, 1891 in Solothurn, Switzerland. He died on May 29, 1961 in Michigan, USA. iv. BENJAMIN ADDISON FRYFOGLE was born on July 13, 1890 in Delta, Eaton County, Michigan, USA. He died on December 20, 1966 in Crane County, Texas. He married Lillian R. ? about Abt. 1926. She was born about Abt. 1905 in Mississippi, USA. She died before Bef. 1966.
v. CAROL DELORES FRYFOGLE was born on December 16, 1903 in Sunfield Township, Eaton County, Michigan, USA. She died on August 01, 1985 in Houston, Harris County, Texas, USA. She married Joseph Simpson Reed, son of David Shelby Reed and Martha J. Kountz, in 1926 in Navarro County, Texas, USA. He was born on July 28, 1881 in Springfield, Greene County, Missouri, USA. He died on November 07, 1964 in Houston, Harris County, Texas, USA. vi. AUDREY IRIS FRYFOGLE was born on March 20, 1905 in Kansas, USA. She died on July 04, 1988 in Merced County, California, USA. She married CHARLES C. BIRKHEAD. He was born on November 29, 1888 in Mississippi, USA. He died on April 12, 1975 in Los Angeles, Los Angeles County, California, USA. vii. VESTA NADINE FRYFOGLE was born in 1909 in Kansas, USA. She died on March 26, 1992 in Los Banos, Merced County, California, USA. viii. VAUGHN FRYFOGLE was born on March 10, 1908 in Lucedale, George County, Mississippi, USA. He died in February 1975 in Lucedale, George County, Mississippi, USA.